A long awaited blog post about the Ubuntu Developer Day. Jorge has been saying ‘PICS OR IT DIDNT HAPPEN!’ for a while now. Anyway, I got all the pictures today morning finally. I don’t remember how I first heard of Ubuntu Developer Day, but I remember registering within minutes of it being announced. I got a text the previous night reminding me that the registrations would start at 8:15 am and the sessions would start at 9 am. The area where the conference was happening was quite close to my place, but with the morning traffic, it took almost 30 minutes for me to get there. I went along with 3 of my colleagues who’d also signed up. Once we got our ID cards, we had a cup of coffee (the daily caffeine dose 😉 ), and moved into the conference hall to get good seats. I’m guessing there were enough chairs for at least 450 people there. I’m guessing there were a few people backing out, because later we saw a ID cards that weren’t claimed. Still the crowd was BIG! 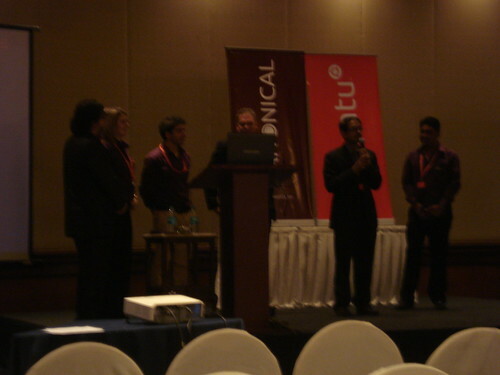 John Bernard from Canonical acted as the MC for the event and we started with Prakash Advani welcoming us. We learned that people had come from Sri Lanka and Himachal Pradesh (that’s 2400 km away!) to be here. After the welcome was John Bernard’s where we are. He started with the Discover Ubuntu commercial. I’m guessing a lot of people have already seen it. It set the mood for the rest of the day I guess. Then came Jon Melamut’s keynote. He talked about the chasm among other things. The talk was mostly things I’d heard of before and for my colleagues it was very interesting to hear about it. I don’t remember a lot of the talks. I should perhaps have taken notes. The talks were too interesting to take notes and I’m hoping the slides will be up some time today. After Jon, Dipankar Sarma, from IBM’s Linux Technology Center talked about the work IBM has been doing in the Linux space. His talk was at the kernel level and perhaps went a bit over my head. 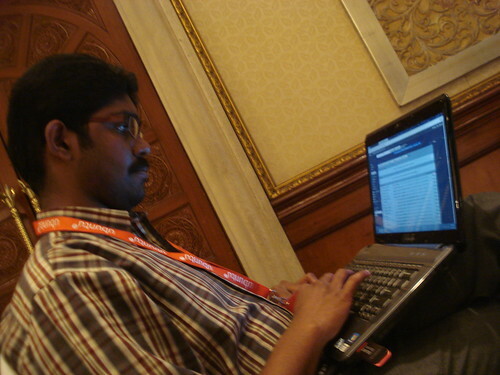 After his talk, I saw Ritesh, a Debian Developer I know, standing up and asking a few questions. We broke for coffee and I chatted with Ritesh for a minute or two before getting back in. After the break, Chase Douglas talked about the work on touch support in Ubuntu. This was a talk I was looking forward to. I had demo’d the touch devices there and it was really cool to try it out. Chase did a really nice session and kept things interesting. Nick Barcet took over for the next 2 sessions. He took the pre-lunch and post-lunch session. Now those are the traditionally more difficult sessions to keep people interested. I have to say, he did a marvelous job of it. It was great to see the work Canonical has been doing in the cloud and server and how things are going. After Nick, we had a talk from Freescale and then another talk by Chase about Launchpad and Bazaar. I had fond memories of Martin teaching me about Launchpad and bzr about 2 years back or so. During lunch earlier, I’d met Hardik and he showed me the multi touch demo. That blew me away. I have to say, it was really cool! I got to see a number of computer manufacturer’s in India selling with Ubuntu pre-installed. Now, I know how which laptop to buy if I buy a new one. We also got goodies! Everyone got a bag which had a T-shirt (don’t think that’s exact one), a pen, a CD, a sticker, a notebook, and a few of the handouts about Unity. Then came the Marvel Keynote. It was mostly talking about products that Marvel has developed and how its used in a lot of places. Then came the session perhaps everyone where looking forward to, ‘Getting commercial applications to Ubuntu users’ by Randy Linnell. Most of the talk wasn’t something new to me, but the audience was quite interested in the talk. I was tweeting quite a bit during a few of the talks. We didn’t have access to the hotel wifi, so I was using my colleague’s internet connection to tweet. 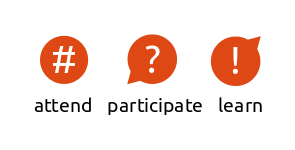 Posted on January 31, 2011 January 31, 2011 Categories ubuntu-planet7 Comments on Ubuntu Developer Day! This post has been long pending to be honest. We had a Noname.unconf planned in Bangalore on 18th and 19th December. The venue we planned was Jaaga. It was meant to be a fun place to meet a bunch of hackers with some talks planned. I met lifeeth, neena, and Hobbes` the previous night when they were setting the place up. On Saturday when I walked in, I sat at the registrations table, signing up people who came. We had about 40 people come in. Interestingly, it was tazz’ and lut4rp’s birthday. There was cake and candles and a lot of fun ensued. I met with a small subsection of the hacker scene that day and it was awesome. Lot of geeks. Geeks are different things. Geeks at networking, web design, sys admin, mathematics, and more. We were planning on a conf app that day and decided to write it general purpose so it could be adopted any day. Later that night, we went for dinner together recounting the experience of the day. Again, good fun. I went in to day 2 in the afternoon. The talks were going on when I walked in. 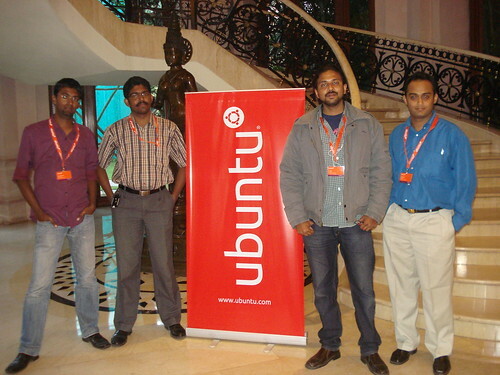 They were quite interesting including the talk about UID in India, Debian and Ubuntu BoF, to name a few. A few more new people to meet that day and then we packed up. It was a fun weekend of hacking, meeting new friends, and talking to people about stuff. Edit: The event will happen on Jan 29th and 30th. 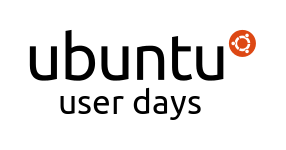 The logo was originally created by leogg for the Spanish User Days. Apologies for the error.